Back in September DH and I made an offer on a short sale. Our offer was accepted a couple of weeks ago and now we own our dream home! I am finally going to have a master bathroom, dining room, and storage!!! The house was built in 1984, but was updated in the late 90s. 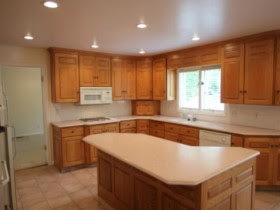 I want to paint the honey oak kitchen cabinets an off-white color. I was also thinking the island would look great in a contrasting black or dark brown. What do you all think? What would you do with these cabinets? I would LOVE any comments and help. Don't forget to link up to the 72nd Penny Pinching Party too. I love all of your thrifty ideas. I need to be thrifty now more than ever with my new big mortgage on top of my current mortgage (hopefully our house will sell fast). Congratulations on buying your dream home! I love painted cabinets! That's such great news. Well done!! That kitchen has so much potential. I've running a kitchen series in the last couple of weeks (beofre my Valentine's mania set in!!). Feel free to have a peek at all the lovely inspiration pictures I found! Hi - I just posted #45 a dress up center I made out of an old armoire my kids used. Thanks for hosting, I know there is a cost now - and we really appreciate the parties! Congrats on the house!! I just moved last year into my dreamhouse - can't wait to see pictures! Congratulations! We just bought a short sale ourselves. Offer made in July, accepted in December. Nothing like moving at Christmas time to keep you in the giving mood. We had great success selling our old home. In fact, we didn't list it until a few weeks after we closed and moved in to our new home. The first day it was on the market, it sold to the first people in the door ABOVE asking price. Fingers crossed the same thing happens for you. We only had one overlapping payment. I love the look of the cabinets the way they are! I have painted cabinets... white, as a matter of fact, and I can tell you they are no joy. They show all the dirt, and around the knobs and handles - omg! Then after you've cleaned them for a couple of years the paint starts to come off!!!!!!!!!!!!!!!!!!!! If I were you, I'd give them a good wood soap cleaning and enjoy your cabinets - as is. Congratulations! Can't wait to see the changes you make in your new home. Thanks for hosting this link up party. I love seeing what everyone else is up to. Congratulations! I can't wait till I can say the same thing! Sounds like a great idea on those cabinets and thanks so much for hosting this great party! Wow, a new house! What exciting stuff!!! Your house will sell fast, you have done so many upgrades throughout it, it's beautiful!!!! Congratulations, can't wait to see what you do with this new house! Love your idea. Go with dark brown. I want to paint mine and they are only 4 years old but they show fingerprints and it bugs me.